The Tempe Sister Cities Youth Group consists of past, future and current delegates selected as exchange students. This group is open to high school aged student. Past delegates become members automatically after being selected as Sister Cities Youth Ambassadors in their junior year of high school. After admission into the Youth Group in their junior year, students can remain in the group until the age of 21. Encourage continuing friendships, both at home and overseas. As part of their connection to the Tempe Sister Cities, The Youth Group participates in many of our programs such as Oktoberfest and the Making a World of Difference Dinner. Additionally, youth group members participate in events at Hackett House and a number of community projects, such as a volunteer day cleaning a section of street or packing medical supplies at Project C.U.R.E., assist in the new delegate selection, and fundraise to attend the SCI International Conference each year. Our Tempe Sister Cities Youth Group members have both obligations and opportunities in their positions as community ambassadors and student leaders. Members of the group are expected to be involved with the organization throughout their junior and senior years, including recruiting students for participation in next year’s program by talking about their own experiences as exchange delegates and hosts. In addition, TSC Youth Group members assist in the selection process by answering questions applicants may have about their experiences. Once the selection of the new delegates is final, the current members throw a celebration event for the new members. 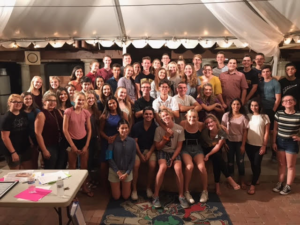 The Tempe Sister Cities Youth Group also hosts events for the new delegates and their exchange sister or brother on their return from their sister cities journey. Tempe Sister Cities Youth Group makes a difference in the community through volunteering. Past members have donated their time as volunteers to work with the community on such projects as Project C.U.R.E., Adopt-a-Street, Fantasy-of-Lights-Parade, Edgefest, the Multicultural Arts Fair, and many more similar events. Additionally, the group currently fundraises for Timbuktu, with our primary school development partnership. The Tempe Sister Cities Youth Group members also fundraise for themselves, and are responsible for keeping a budget for their organization. This money goes to support events like the Youth Group Prom for International Delegates, which is given each year to allow the sisters and brothers who come to Tempe on exchange to experience an American prom, as well as parties such as the one given to celebrate the new exchange student selections. They also use these funds to help offset costs for members attending the annual SCI Conference. Would you like to know about the activities of these young leaders? Then sign up for our newsletter today! Receive our Tempe Sister Cities email newsletter to stay informed of all Tempe Sister Cities activities, including our youth group activities and accomplishments.